Irelentless succession, a parade of towns and cities have this year joined the bloodstained ranks of American mass shooting locations. The mere mention of the places — Charleston, Chattanooga, Colorado Springs, San Bernardino — evokes images made familiar at Columbine and Virginia Tech and Tucson and Newtown: the police battalions rushing to respond, the shocked survivors and bereft loved ones, the eerie portraits of newly infamous killers. But the truth is that these cities and towns and the events that now define them, however lethal they were and however large they understandably loom, comprise just a small fraction of the gun violence recorded in America during this or any year. In 2013, the last year for which government statistics are available, less than 2 percent of more than 33,000 gun deaths in the country were due to mass shootings. Tallies of gun-related fatalities are in turn dwarfed by totals for gun injuries. Every 12 months, more than 118,000 people are shot; many are left with devastating physical impairments and crippling health care bills. Thanks to a nonprofit, nonpartisan project known as the Gun Violence Archive, data on gun homicides and non-fatal shootings is now available well before the federal government releases its statistics. That data includes location information that makes it possible to plot those shootings on a map showing how many have taken place in your vicinity. Where someone was killed, the shooting is coded in red (this includes multiple victim incidents with a mix of fatalities and injuries). Shootings resulting in injuries but not deaths are coded in yellow. Violent crime has fallen drastically since the 1990s, but guns stubbornly claim a disproportionate share of American misery, with rate of firearms-related death largely holding steady for the past 15 years. That grim constancy has come as regulation, industry safety improvements, and public health campaigns have reduced the mortality of other products. CDC tables show that in 2013, guns killed 3,428 more people than falls, 4,635 more people than alcohol, and 30,876 more people than fires. Researchers have forecast that 2015 will be the year that bullets kill more Americans than car accidents, which had long been the leading cause of death due to injury in the U.S. Rarely does routine gun violence make the front pages. Always, there are Americans for whom it hits home. That may be the volunteer EMS crew in Imperial, Nebraska, who lost longtime member Dave Ridlen to a rifle accident in early November. Or the Carthage, Texas, family robbed of a 22-year-old son after Jonathan Todd Williams was asked by his father to answer a knock at the door, only to be blown away. It includes the South Carolina grandmotherkilled in her car when her two-year-old grandson found a loaded revolver in the backseat. Or the eight members of Valerie Jackson’s family, including six children, all murdered by her ex-boyfriend David Conley, who acquired a gun online despite being prohibited from owning one. But even as gun violence occurs all over the country, its burdens are unequally distributed. In parts of cities like St. Louis, Chicago, and Baltimore — not to mention forgotten parts of cities like Charleston, Chattanooga, and San Bernardino — shots ring out with terrifying frequency and density, without drawing CNN’s broadcast trucks or prompting the President to step up to a podium. Public opinion polls show that Americans are concerned about gun violence in general and are dramatically under- or mis-informed about its specific consequences. Asked in an OctoberWashington Post/ABC News survey, 46 percent of Americans called new laws to reduce gun violence a priority. Those queried separately by the Huffington Post that same month grossly underestimated the number of Americans who died by guns, with the median guess coming in at 5,000 per year, less than a sixth of the actual total. The interactive map included in this article is the result of a collaboration between Slate and The Trace, employing the aforementioned Gun Violence Archive data. It represents an attempt to close the gap between awareness and understanding. 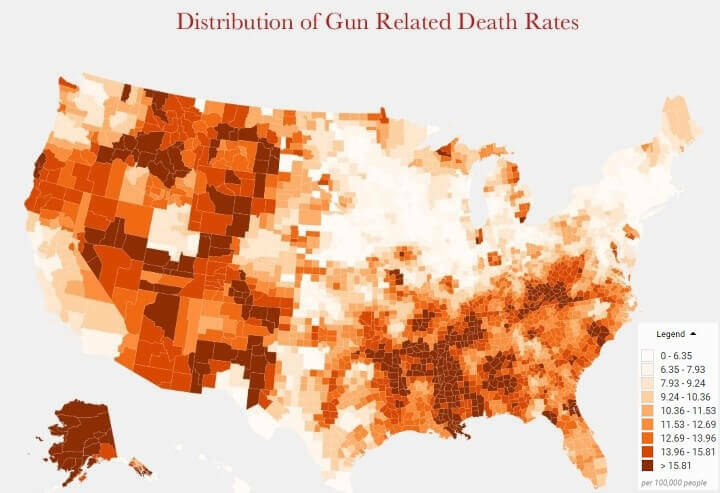 When shooting deaths and injuries are laid out geographically, one is able to assess first the sweeping reach of gun violence and then its pernicious patterns, the dots growing ever denser as the reader scans from the countryside to the suburbs to the inner city. Finally, mapping gun violence this way makes it possible to see how often it has played out in your own neighborhood, town or city, and state — and how close it has come to touching the routes you travel in your own life, as well as those of your family members, friends, and coworkers. In all, the map contains 30,284 incidents recorded by the Gun Violence Archive from December 5, 2014 to December 5, 2015. As comprehensive as it is, it’s also incomplete: Guns are used intwice as many suicides as homicides (and are the most lethal means of suicide). But because many suicides are not reported in real time by the law enforcement sites and news outlets that the GVA mines in compiling its database, they are missing from this visualization. Also not included are are an additional 9,000 episodes in which no one was struck by a bullet, though some of that gunfire undoubtedly affects those who witness or hear it. Our plan is to update this map in a few ways. The first is to add details about the ages and genders of the victims to the summary boxes that pop up when you click on a pin, and the option to view layers of economic and demographic data to the map as a whole. Every three months or so, we’ll also refresh the map with the most recent 12-months’ worth of shootings. In the meantime, we’ll work with the Gun Violence Archive to refine the underlying data as more granular information becomes available from press reports, law enforcement sources, and reader feedback. Correction, Dec. 8, 2015: An earlier version of the shootings map included incidents of gun violence in which somebody was injured but no shots were fired, such as pistol whippings, as well as incidents involving pellet guns. These incidents (which total 636) have been removed, leaving the updated map with 30,284 shooting locations. Correction, Jan. 4, 2016: An earlier version of this article misstated the number of people shot in the United States in 2013. The total number is 118,000, not 130,000.